Type Ia supernova PTF11kly in the Pinwheel Galaxy (M101) 21 million light years away. Image credit: Astronomy Picture of the Day. Last night, I was in the Berkeley-based remote control room of the Keck telescope watching Professor Josh Bloom and his team follow up what Bloom claims to be the “supernova of the generation.” PTF11kly, a type Ia supernova discovered by the Palomar Transient Factory in California, is one of the earliest and closest type Ia supernovae ever observed. How did I stumble into such an important observation? Josh invited the Berkeley first-year graduate students to watch his team remotely observe on the Keck telescope. Even without the prospect of standing witness to scientific history in the making, the five of us were excited to watch the complex operation of Keck, the largest optical telescope in the world. While Josh facilitated observations from a control room in Waimea, Hawaii, the rest of his team controlled the instrument from a duplicate control room at UC Berkeley. From the windowless basement room with an array of plush carpets covering the otherwise sinister black-and-white tiled floor, the other first-year graduate students and I watched history happen. Using the LRIS spectrographon the Keck telescope, Josh’s team obtained one of the earliest spectra of a type Ia supernova ever observed. Control screen for the LRIS instrument on Keck. In yesterday’s post, Kim Phifer describes how the thermonuclear explosion of a white dwarf generates a type Ia supernova and how we can use type Ia supernova to measure distances. Historically, type Ia supernovae have been used to measure the rate of the expansion of the universe. Precise measurements of the distances and recession velocities of type Ia supernovae resulted in the discovery that the universe is expanding at an accelerating (not decelerating) rate. The cause of the acceleration is unknown; scientists call it “dark energy” because we cannot see (or understand) what is driving the acceleration. Because PTF11kly is so close, the measurement of its brightness and recession velocity will contribute to our understanding of dark energy’s recent behavior and might reveal a few quirks that we are not expecting. Furthermore, PTF11kly is so close and bright that it provides an excellent reference for how type Ia supernovae really behave. 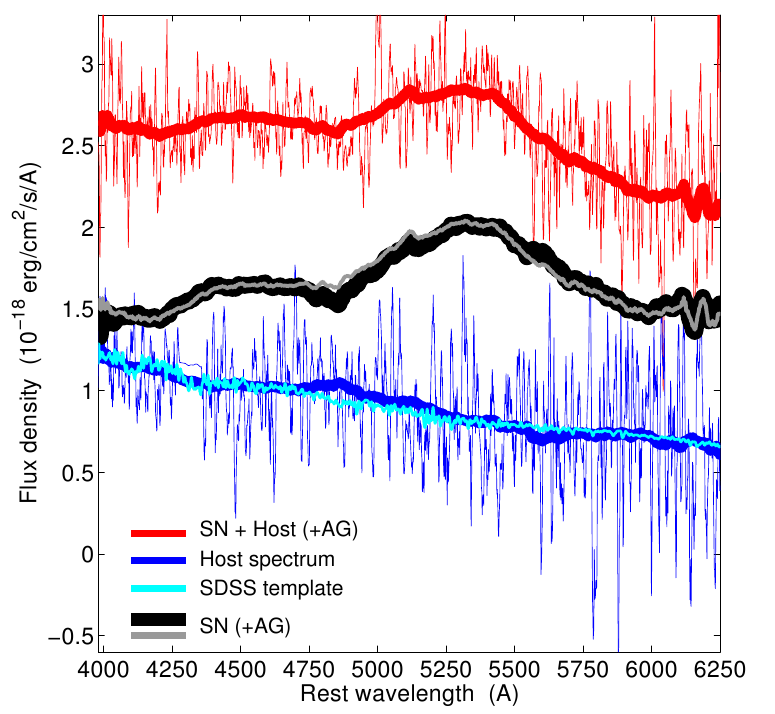 Last night, Josh Bloom’s team was very excited that the supernova’s spectrum has carbon absorption lines. This means that carbon is present in the supernova remnant. Most type Ia supernovae spectra lack carbon, but theories predict that early type Ia spectra should have carbon because a white dwarf is made of mostly carbon. As the supernova explosion progresses, the illuminated portion of the supernova remnant passes outward, and carbon should disappear from the spectrum. PTF11kly is a perfect testbed for these theories: we will have to see how long the carbon absorption lines remain. 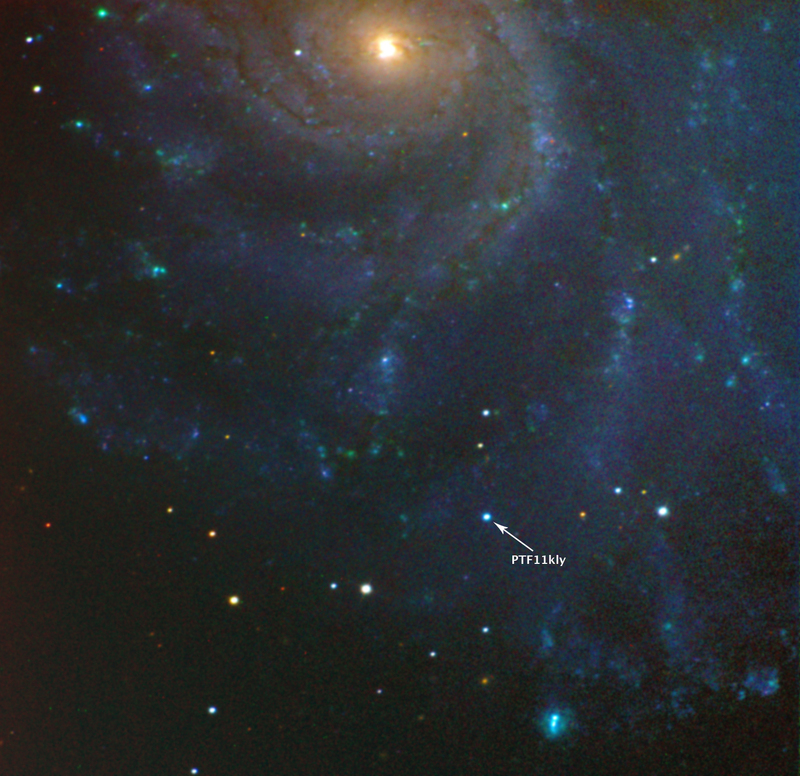 PTF11kly is 21 million lightyears away in the Pinwheel Galaxy (M101). 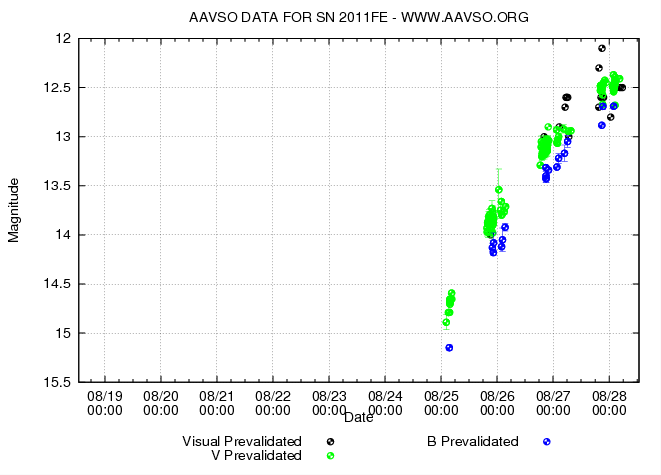 During our observations last night, it was at magnitude 12.3. It is expected to continue brightening until September 10th, then fade. Whether it corroborates or challenges current theories about type Ia supernovae and dark energy, PTF11kly has a literally and figuratively bright future. Light curve showing the increase in brightness (decrease in magnitude) of PTF11kly over time. Image credit: AAVSO.